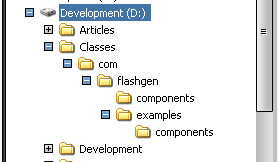 In the previous article we dealt with the initial concepts of the component clip and how to associate it with a class. Now we are going to move onto the class and how we merge the two to create our component (read this if you need a refresher). As we have a component clip to work from and we have added in our classpath via the Linkage identifier and the component definitions dialogs, we can now set about putting the class framework together. Firstly we need to put our class in a package (that’s just a folder structure on your file system if you weren’t already aware). So all we need to do now is apply this to the clip to produce our test SWF and finally our SWC ready for use to add to our components directory so Flash can read it in, or distribute it so others can benefit from our new component :). So What Exactly Does A Component Clip Require To Be A Component? Well to put it simply it’s just a movicelip named after the component with two layers, the first layer is called Actions and only contains one frame, in this frame we add a stop(); action. The second frame is a little bit more indepth and contains two empty key frames, for clarity we’ll name this layer Assets. In the first frame of this layer we need to drag out a copy of the BoundingBox moviceclip from the library and place it so it’s aligned top left to the central registration point of the component movieclip, (grab the Basic Component Framework files from here if you haven’t already). Next we need to resize this so it is set to the dimensions required by our component for its default width and height – for example if we were creating a Button component we may set the BoundingBox clip width to 100 and its height to 22; this would set the default dimensions of our component to these settings when it initializes alleviating the need for the user to set a default value for them before they can actually use the component. Finally we need to set the instance name of the BoundingBox to, strangely enough, boundingBox_mc. Realistically speaking we can call it anything but to make it easier to learn more about how the components by Adobe are constructed we’ll try and keep the naming conventions close to theirs where the component framework is concerned. If we are creating a non UI based component we place an instance of UIObject or UIComponent from our library in this frame*. And finally if we are extending another component we would drag the uncompiled version of the component we are extending from. i.e. that components component clip. Now we have added the relevant instance of the component framework to our component clip we are ready to test it. First open up the linkage dialog box and make sure that the Export for Actionscript is checked; we don’t need to check the other export option as we aren’t exporting this in the same manner as other linked assets. Once we have the linkage set we are ready to make our first test SWF. To do this right click on the component clip and select on Convert to Compiled Clip. Once you have selected Export SWC File… a dialog box will open and ask for a location and a name for the SWC. Make sure you name the SWC with the same name you gave your component clip. For example if you called your component class ExampleBox.as, your component clip would be called ExampleBox, as would it’s linkage name and finally it’s SWC. The reason you have to make sure the SWC is named correctly is due to the fact that once it is imported into the component library in the IDE, Flash reads the name from inside the SWC not the actual file name. So if you accidently named two component clips the same but named their SWC’s differently in your file structure they would be different but in the component panel they would both appear but have the same name! Now that we have successfully exported our SWC to a directory of our choice we only have to add it to our component panel. Now Adobe’s docs detail where Flash stores all it’s user files. For your own components I would suggest making your own folder inside this folder – I have one called FGComponents and I place all my components into this. Once you have copied your new SWC into this directory or a sub directory you will need to reload the component panel. You can do this by opening the panel menu, (the little file icon in the top right of the component panel bar), and selecting Reload. Once the panel refreshes you should see your subdirectory and if you expand it you’ll find your new component inside. Now all that is left to do is drag it from the panel to a nice fresh FLA and have a play. Pingback: orange.flash » Blog Archive » ?????? ???????? ?????????? ?